stockton (2), originally uploaded by aliceatwintersong. If you happen by here a lot, you may have wondered what the heck’s going on with all these photographs. I’ll explain. For one thing we’re still sort of fresh back from our vacation and I’ve downloaded all 942 pictures on my computer’s hard drive–added to the other 1579 already there! “Yeesh! Enough already” I distinctly heard PC sigh. (I’m just kidding. A little. I don’t really know how many pictures are in either place. I can’t count that high.) Long story short, I paid–yes, actually PAID–for a “pro” account at flickr.com so that I could upload everything there and organize it, because I knew I had to do something. While I’m trying to accomplish all that, I keep popping by and catching up on my blog favs, and see Grannymar (check blogroll on the sidebar) taking photographs like crazy and actually getting good at “seeing” the picture she wants to capture. So now I carry my little camera in my bag and take pictures of buildings, ivy climbing buildings, ants, woodchips–most anything that doesn’t get out of the way real fast like those cute little baby Gambel quails I’ve been chasing and terrorizing for days now so I could show them to you. I think you can see the problem of storing all those pictures. So I’m giving you fair warning. In order to accomplish this humongous, or as yankees imitating southerners would say (I never heard a real southerner say it! ), bodacious job, it makes it more fun to post a few now and then and write something about them. I hope you don’t get too bored, because I might, but I’ve gotta get this done. My PC’s hard drive will be so relieved. 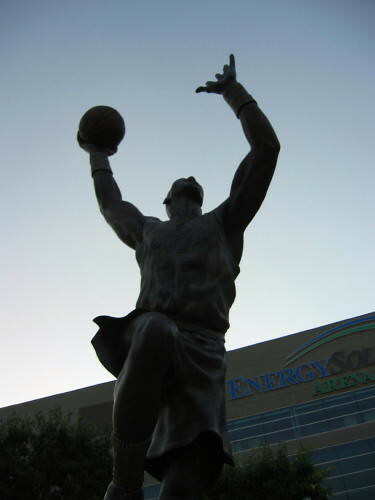 Above is a statue of a basketball player named Malone in front of Energy Solutions which is the home of the Utah Jazz NBA team in SLC. I really don’t know, it could be Stockton, as well. I don’t know one from the other, but my guess is that it’s Malone because the famous sportscaster quip was Stockton to Malone, as Stockton would pass the ball to Malone who would then sink it in the basket. They were a formidable team apparently. It was getting dark (after 8 o’clock in the evening) and we were walking to the car after attending the Obon Festival (a Japanese ceremonial celebration dedicated to remembering their deceased relatives) and I like the way the statue looked silhouetted against the sky so I took a picture. Here are a few of the folk dancers in colorful costumes. One of these days I hope to get those little Quail biddies. In the meantime, I hope you’ll bear with me because sure as tootin’ I’ll be back with more later. And after it’s all done, I don’t know where I’ll go then. We’ll just have to wait and see. At least now you know what’s going on. This entry was posted in Families, musing, Musings, Personal, Photography, Yeah, but is it art? by Alice. Bookmark the permalink. How much is the Pro Account, Please. I’m having horrid problems with Snapfish, and my computer won’t use Photobucket…..tho there pictures are fractionally sharper. We will be flying through SLC on our way to a wedding reception. I’ll wave at you. Hi Mage. The cost isn’t too bad considering. $24.95 per year, with no (or few anyway) limits though I couldn’t site any oft hand. If you don’t renew the pictures stay there for whatever forever/flickr turns out to be. I’m also backing them up on CDs. Leave it to you, Dr. V., to confirm Malone’s ID–but somehow I remember him as Moses? Maybe it was a nickname. Also, your father informed me that the proper term for what he did should have been “dunk” instead of “sink.” Sigh……. Picky. Picky! Mom, Moses and Karl are two different players! This one’s definitely Karl.